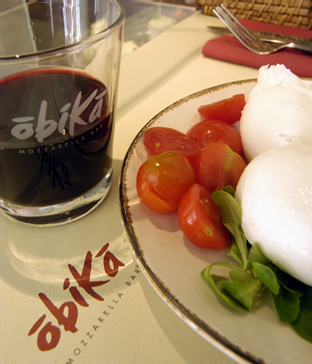 Obikà became a hit in the Eternal City when it opened in 2004, conceived as a kind of sushi bar that plied its trade with buffalo instead of fish. You can expect the same mozzarella sampler and other small plates starring the Italian cheese. Purchase Mozzarella di Bufala for $9.99/lb at iGourmet. Close your eyes and picture heaven; are there soft, billowing clouds, soaring golden gates, and friendly angels flapping their feathery wings through the honeyed air? Not for me there aren't. For me there is nothing but a vast expanse of mozzarella di bufala, small white puffs of fior di latte extending in all directions even past the horizon. Instead of angels, I see water buffalo; in place of golden gates I see giant wooden barrel vats with fresh curds floating in green whey.